Around 8 o'clock we are picked up by a bus at the entrance of the campsite. After halting at a dozen hotels to pick up other people we arrive at 10 at the harbor of Vilamoura. The place is near Albufeira and we could better have taken a taxi. Half past 10 we put out to sea. At first we can't find a pleasant place to sit, so we end up at the back of the catamaran, just above the engines. But that also means we inhale all the exhaust that stays close behind the boat, so we soon leave this unhealthy place. Most tourists on the boat are English and they are all talking about earlier trips to other countires. Many tourists have this problem. Boasting about the things one has seen, seems to be more important than the trip one is making at that moment. Teije had seen it a lot when he was a tour guide. Well, we enjoy our trip and marvel at the coast of the Algarve with all the beautiful beaches and limestone rocks. From Vilamoura the catamaran sails to the west and soon we pass Albufeira in the distance. We can't zoom in with our camera so the coast keeps it's distance. We really need to buy a better camera! Limestone is a soft material and thus the south coast is good carving material for the sea. The rocks have been sculpted into whimsical figures and everywhere there are small inlets and creeks we would never have seen from the road. At 1 o'clock we reach Portimao and it is time for lunch: fresh sardines, of course... The boat halts for an hour and whoever wants to can take a swim. It looks very tempting, but we have had our share in the sun and the water, so we decide to be careful. On the way back we have another experience: in a smaller boat we visit caves along the coast and sail under rocky arches. To prevent the camera from becoming wet, we don't make any close up pictures. We become very wet, though. There is only one big disadvantage: everybody wants to make a trip in the smaller boat, so it takes hours before we can sail on. After some time this can get boring. Eventually everybody has seen every cave and we can go on. Sitting in the sun, Elisabeth feels her skin starting to itch again and she can't resist to scratch and pull it loose. We wonder how many more layers will come off. About 6 we are back in the harbor of Villamoura, but it is 8 before we are back at the campsite. The bus first goes to all the other hotels and, although we passed the campsite several times, we are the last to be dropped off... We have made a wonderful trip, really worth while. Only those tourists, they can be so tiresome. We want to spend one last, quiet day in Albufeira, but then it is time to move on. We don't want to be idle for the rest of our holiday. So we start with a visit to our 'own' beach. There are a handful of people on a beach of more than a kilometer long. We have to drive off-road around the village and then walk hundred metres, across a long wooden footbridge over the dunes. It is a very quiet place. In the afternoon we have a long drive off-road and it is amazing to see how many houses, mostly luxurious villa's, there are in the middle of nowhere and how many new ones were being build, with swimming pools from where one probably can see the sea in the distance. Nice place to stay when we are retired. Of course we have to meet Monique and Enrique for a last time and we have a drink in an outdoor café. We notice a small cool wind, so the temperature is getting more bearable, at most 35°C. Still a nice temperature to have a cold beer. At night we go out to have dinner in the old centre of Albufeira where gipsies try to sell their merchandise and get around the police. They unpack their merchandise within a few seconds and have it packed again in seconds when their familymembers on the corners of the square warn them. A ritual that is repeated many times. We have lots of time today; the trip to Lisbon is only 250 km., so we take small byroads. When we leave the Algarve we notice a change in atmosphere, as though the heat becomes more dusty, we don't know a better word for it. Maybe it is the lack of cool ocean air. The vegetation is also changing and everywhere we see skinned cork-oaks. In the evening we enter Lisbon across the famous 25 of April-bridge where a 28 metres high statue of Christ stands on a pedestal of 82 metres high. We have a clear itinerary to the campsite, but we miss a turn and get lost on the road network of the city, so we see more of it than we have planned for the first day. 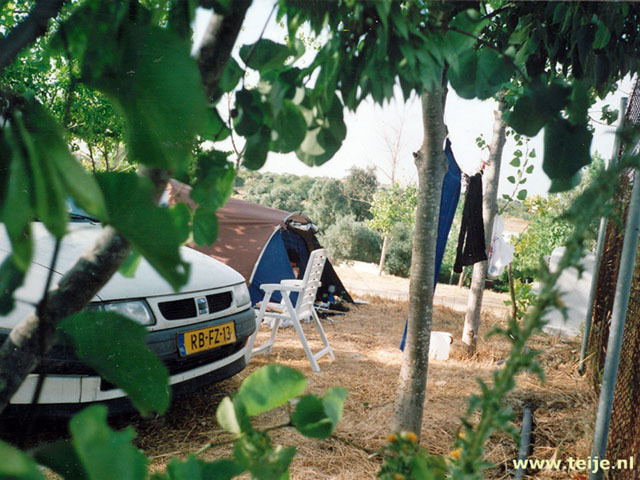 But we get there and think the campsite is very luxurious, even more than the one in Albufeira. We install ourselves near a washing accomodation and a power outlet, so we can boil water for our tea and coffee in the morning. In the shadow of the trees it feels much cooler and better than the place we had in Albufeira. The day is coming to an end and we decide to take 2 days to look around in Lisbon. Tomorrow we will make a guided tour through the city so we will see and visit most places of interest in a short time. The day after we can visit the centre on our own. But first we pay a visit to the swimming pool to swim and read what our travel guides can tell us about this city.